The off contract beast you need. If you are looking for an off contract device with great features and great battery life, then this device is exactly what you are looking for. The Huawei Ascend Mate 2 4G LTE, Huawei’s latest flagship devices was unveiled in June of this year. Most people know Huawei for their telecommunications networks which services inside and out of China. Little known fact is that Huawei currently serve 45 out of the top 50 largest telecom companies in the world. With that, their mobile development is taking major strides and pushing its way into the US market. The Huawei Ascend Mate 2 is a major device coming along with major push from other Chinese OEMs breaking into the US market. The device is an off contract offering with a small price tag of $299, and can easily be purchased from GetHuawei.com. Without further ado, let’s get into this device. When I first received the device I was surprised by the light weight feel. The device is mostly plastic (polycarbonate) similar to Samsung devices. However, it doesn’t feel cheap like some devices with the same build material. This is a metal trim that surrounds the device that protects most drops and dings from damaging the device. I didn’t perform any drop tests with this device as I am not the owner, however I would suspect that it would hold up just as well as any similar sized device most comparably the Note series of devices. Overall this device feels great in your hands, while not being too cumbersome that you feel like you are holding a set of weights. Flip it over, and the display hits you right in the face. This 6.1” HD display is simply amazing, packed into the frame nicely without taking away too much screen real estate with bezels; Rocking 1280×720 enhanced HD, it is beautiful to look at no matter what you are doing with it. There are no physical buttons on the display, instead Huawei favored capacitive keys like most devices nowadays. The power button is about thumb height on the right side of the device with the volume rockers directly above that. Though I was concerned with the size of the device at first, considering I don’t have the largest hands, I didn’t feel overburdened with the device when I was using it. Everything seemed to flow nicely and I could get to everything I needed just fine without too much fuss. Alright, so Huawei went big with this device and packed a 6.1” HD display into it without making it seem like you are holding a device that has the large of a screen. The brightness is amazing, with no haziness or blurring of colors through anything that I put through the display. Outdoor use was no issue with the device either, having direct sunlight on the screen did have a glare, however I was still able to read the device without too much strain. I did a quick comparison to my LG G2 and the Huawei Ascend Mate 2 edged it out in the glare department at brightest settings with readability in regards to glare factor. Gaming on this device is also amazing, the display adds so much to the real estate available for any game. FPS, racing and even regular tap and play games look awesome on this device. The shading and color saturation blends together nicely while playing any games, mostly FPS gain a benefit from this. Overall, compared to most displays on current flagship devices the display on this device is on par if not above some current devices I have put it against. So with the camera, I was able to really test it out and compare to a similar setting device. The Mate 2 rocks a 13MP camera on the back that allows for some amazing moments. I compared this to the 13MP camera on my LG G2, and comparatively speaking the Mate 2 did amazing. The shots were clear and the colours came out very nicely. I am not a professional photographer so I don’t really know exactly what all the different settings do or how to get the best shot possible, however, I was pleased with the results of the photos that I took. There are all kinds of settings that normally come with camera apps on Android, most of which are for people who know how to tweak them to get awesome photos. One area that both the Mate 2 and my G2 struggled with were low light situations, which isn’t surprising to me with auto focus. The auto focus has a hard time pulling the objects in and you end up manually focusing to save time. Overall, the camera is very nice and if you are good at the settings you can probably get even better results than I was able to get. The front facing camera works just as well as any front facing camera should. Selfie shooters jump for joy, but you will have to test that on your own because I won’t be including any selfie photos taken while testing. The Mate 2 is currently running on Android 4.3, Jellybean, with Huawei Emotion 2.0 lite UI on the top. Those not familiar with the Chinese OEMs will find something unusual when they get to the home screen on this device. There is no dedicated app drawer on this device, so you end up with something similar to iOS devices where all apps are on the home screen. This can be changed by adding a home screen replacement app, but I didn’t bother as I wanted to experience the device with the stock experience. I honestly wasn’t thrown off too much by this as it was a welcomed difference. Not having to go to the app drawer and swipe across to find the app I wanted, just placing them on the home screen where I knew where they were is all it took. Nothing fancy from Huawei here with this device in regards to things like Blinkfeed or Rss feeds directly on the home screen. Weather widget and Google search bar are the only widgets pre-installed on the home screen. Of course there are different themes available to change the look of the stock home screen appearance similar to that of the LG devices, however the themes really don’t change too much across the device. One bonus with this device having a 6.1” screen is that the grid size is fairly large so you can fit a lot of apps and widgets on the first home screen to save from swiping through to find the apps you want. This is where Huawei shines through, honestly surprised me with these settings. Being a small handed individual, I first went to the settings to see what I could do to ease my use of the Mate 2. The one hand operation settings made things really easy. Like most one hand operation settings, the keyboard and dialer are made accessible to either side of your choosing for easy use. One feature that Huawei has that was really awesome is the Glove mode. Basically you can be wearing gloves and still operate the touch screen function on this device. Nothing special about the gloves are needed either, they don’t have to have stylus lined fingertips, just regular gloves. I tried with leather, cloth, and vinyl gloves and all were successful with operating the phone. The leather gloves were a little tougher to use compared to the others which I contribute to how thick leather gloves tend to be. Cloth gloves worked just like I was touching the screen without gloves on. At first it seems a little weird to be operating the device with gloves but in the cold weather this will be a definite plus. This is where the Huawei Ascend Mate 2 excels against almost every device in the market. The battery in this device is INSANE. Huawei dropped a 3900 mAh battery inside that in writing claims 60 hours of standard use. What is standard use though? Well, I put this device through a beating to see how long the battery would last me. I went light to moderate use the first few days to allow the battery to charge a few cycles to get it broke in and then went crazy. I streamed nothing but Netflix through it from full charge until it was yelling at me to charge it, surprisingly I could get 13 hours of streaming out of the device with screen on time matching up, notifications turned off for all apps and sync turned off. I was simply amazed by those stats, considering other devices I have had put me against the charging location after two movies. What if I don’t stream movies through my device you ask? Well, next I did nothing but social media and internet usage with typical on and off screen time and I was able to get roughly 25 hours out of it. Granted I am not the most popular person in the world so my social media doesn’t have me going all the time, but I made it a point to be more involved with my stuff while testing the device. Now if neither of these two tests describe you as a user and you are the type that uses a mobile device for a mobile device, making calls and sending texts and email only, you will be happy. I did my last test making only calls and texts, sent out a few emails and this is the most amazing result ever. With light use making calls and texting/emailing I was able to get well over 2 days out of the battery. 2 FULL DAYS, 48 HOURS of use out of the Mate 2, I was simply blown away with those results. There are settings for the battery to get more or less life out of the battery depending on your situation but I left it on stock and had no issues at all. The setting change really only gains you roughly an hour or so life, which unless you are in dire need of it isn’t much of a difference. The sound quality in the Mate 2, overall, is decent enough. The audio quality over auxiliary and Bluetooth was nice and crisp as expected. The speaker is located on the rear of the device, and surprisingly wasn’t too bad. I didn’t expect a surround system, but I was happy with the overall sound coming from the stock speaker. It really isn’t fair to compare it to the HTC boomsound, but with the technology out there it is disappointing that more devices aren’t putting better sounding speakers in their devices. However, I do not hold Huawei lacking for not doing it with the price and setup for this device. The sound is great and better than that of my G2 and the G2 is a major flagship device. The ear piece speaker is nice and crisp, with no issues, I heard every word even from light spoken people I was able to hear clearly what they were saying. The background noise isn’t drown out completely but it doesn’t overwhelm you like some devices do. Being such a new device, there do not seem to be any ROM or Root options available for this device just yet. With time, I expect some root and rom options to become available mainly due to the fact that the battery life is so amazing and people who get the device will want to customize it like any other Android device. With the Mate 2 sitting on top of a QuadCore Quad Cortex A7 the speed of the device is amazing. No unexpected lag from the device perspective happened during my testing at all. The device performed very well multi-tasking and switching between apps very quickly. Loading times for apps not needing 4G were processed quickly and about the same as other devices I compared it to. At times when running through the settings or launching the app switcher, it did feel a little big slow to launch compared to the G2, and sometimes it was a little slow to wake when wanted to do so. Otherwise, it seemed to fly through everything I asked of it; Games loaded fast, internet browsing was one of the quicker I have used on a phone. Page loading and other animations are smoother than I was expecting based on the hardware. The 2GB RAM on it, while fairly standard, put up fine and I had no issues with slow downs associated with running low. 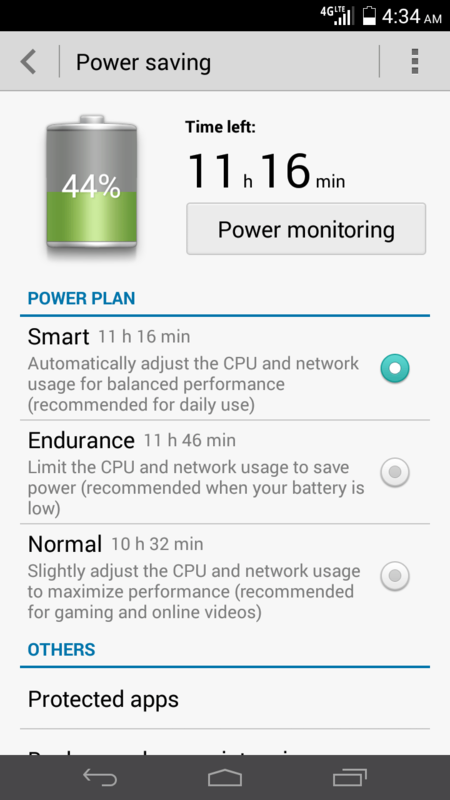 Overall, the Huawei Ascend Mate 2 4G LTE is one of the best off carrier devices I have seen to date. I was worried that being off carrier would affect the device a little but I really didn’t experience any issues with it. One of the best things about this device is the lack of bloatware that comes with most OEMs currently around the market. I honestly consider getting this device as my daily driver once my contract ends, but by the time that happens hopefully Huawei has something even newer for me to drool over. My fears of the plastic feel were washed away by the overall construction quality and build of the device. My fear of the UI was quieted by the smooth transitions and overall ease of use with a much larger device than I am used to. Lastly, my fear of the unknown with a fairly new OEM in the mobile market was thrown to the wayside by an overall amazing device, which took everything I could throw at it and came back asking for more. The lack of pre-installed bloatware made me cheer as finally a device with amazing performance wasn’t hammered down with unused apps or control features that make the device unusable. Overall, if you are looking to make the move off contract and want a daily device that can get you through your entire day and more, with no bloat, great features, and an awesome support team then the Huawei Ascend Mate 2 4G LTE is the device for you. Just go to GetHuwei.com and select the device, oh and as a bonus for ordering this awesome device at $299, you get the sim kit for $50 worth included in your purchase. This will get you up and running as soon as the device arrives.